I can't think of any picture books right now, but my 3rd grader really liked the Joey Fly, Private Eye graphic novels and, last year, The 3-2-3 Detective Agency. Your comment about looking for clues in a story making a better reader really made sense to me. Also opens the door to discussion and humor which are things I cherish when reading to children. I like Grandpa's Teeth by Rod Clement which has all the elements of mystery, even red herrings. It also is good for problem solving in general. Another 3rd grade mystery series I like are the Milo & Jazz books by Lewis B. Montgomery. My favorite young reader mysteries though are The Buddy Files by Dori Hillestad Butler. The books are told from the perspective of a dog who gathers clues to solve the mysteries. I like Doug Cushman's Aunt Eater series, John Kelly's Mystery at Eatum Hall, and Eileen Christelow's Robbery at the Diamond Dog Diner. True. “Reading mysteries is such fun, but it also sharpens your reading skills - getting you to notice clues as you read, pay attention to character's motives, and making predictions. All of these are important skills. Thanks for sharing this book list. I love your book suggestions, but the title of your blog entry is misleading. 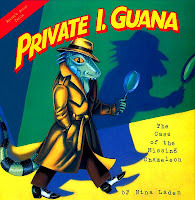 Outside of Private I. Guana, none of the books are picture books. They are all chapter books. Thanks for this article. I have written a post on this topic as well with books for age 3-8. I like The Mystery of Eatum Hall, as someone mentioned above, Miss Nelson is Missing and the Ace Lacewing books. Some mystery picture books don't have clues, more of a sense of mystery.